It’s been great to see the reaction to our Trunk Show calendar since it launched in September. You’d expect artisans to be keen, given it’s a free way to advertise their travels to Permanent Style readers (surely some of the most discerning bespoke consumers in the world!). But readers have made avid use of it too. Every day, hundreds of people click on the calendar (it's at the end of the nav bar, in purple - in case you haven’t seen it) to check on which artisans are coming to their city in the near future. “I had the opportunity to meet with Kathryn Sargent this evening for a fitting here in Chicago. This was a direct result of the Trunk Show tab now found on your website. Reports like this are lovely, not just for the benefits they clearly bring to the reader, but also for tailors and shoemakers - the twin rewards of which have always been one of the nicest aspects of running Permanent Style. We’re currently working on ways to update readers on artisans coming to their area, by alert rather than having to manually check. So if you have any suggestions or feedback in that area, please let us know. The calendar is fairly simple to use, but readers have had one or two questions about the functionality. The initial list can be quite daunting, but quickly becomes manageable when you filter for where you are. Simply select a country or city from the drop-downs (below ‘Narrow your results’) and hit ‘submit’. If you want a more visual list to browse at any point, click the ‘Month’ option on the right, and change the view to ‘Photo’. When we launched the Trunk Show calendar we thought we had a pretty good list, but it has hugely expanded since then. 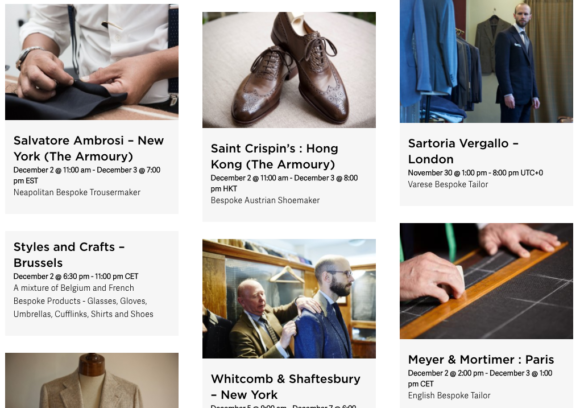 This has partly been a result of readers suggesting to their tailor/shoemaker/shirtmaker that they should get involved, and as early as possible when they have a new trip. So if you work with a bespoke artisan who isn’t included, please do push them in our direction. Thanks again to readers and artisans alike for making this work so pleasurable, and for keeping this virtuous circle of writer-artisan-client turning. You can follow the discussion on Update: the Trunk Show calendar by entering your email address in the box below. You will then receive an email every time a new comment is added. These will also contain a link to a page where you can stop the alerts, and remove all of your related data from the site. -> Every reader could add himself to a “interested” list for a particular artisian for a particular city. For example I could put Interested in “Musella Dembech for a visit in Munich”. -> The artisians could get access to an overview of how many customers would be interested for a visit in a particular city. And if the artisian thinks that the number is sufficient, they could plan a trip. Why would this feature be useful? Because now for a reader to show interest for the artisian in a particular city, the reader has to write an e-mail or make an international call to the artisian which is a much higher psychological barrier than just do several clicks on your page (enter of name and e-mail makes sence so that the list has not duplicates ). Just imagine the akward phone call “Hi, I am a big fan of your work, I don’t plan a trip to London, but please put a note that if you happen to go to Kopenhagen, I would be interested to get an appointment”. For an internet database there is no such psychological barrier. And there is no problem to have exotic inputs like “Cifonelli in Mexico city” or something like that. For the artisians there is also the advantage that they don’t have to keep track of the lists themselves. And this could open them unexpected opportunities. There might really be a huge interest for Cifonelli in Mexico city, but who would know that if this information is not transparent. Hi Simon what about Bocache & Salvucci ? Hi Simon, the calendar is a nice addition to the site, thanks. However, I assumed that all of the artisans on the calendar would be people featured on the site. One tailor for example, Sartoria Sabino, is someone I do not believe you have written about in the past. What are your thoughts on this? Just my congratulations, excellent work! It is sad Madrid does not attract more trunk shows… At least I have PS….